After Canada Day our focus immediately shifted to getting ready for Girl Guide Camp. We use the local camp, Camp Chip, and this year we were there from Friday evening until Sunday afternoon. As a Guide Leader a lot of prep time goes into camp, even when, as with this year, I wasn't the one doing the bulk of the planning and prep. I still had badges to teach, games to put together, crafts to prep, myself to pack for and my girls to supervise. This is a special year for our family in Guiding because both girls are in Guides this year. I've had the joy of both of my daughters each week and get to share camp with them both. We're taking every advantage of the time together. They'll get a year together again in Pathfinders, but I'm not a Pathfinder leader, so I won't get to be in on the action, it will be just for the two of them to share. Anyway, my living room got covered with stuff as I dug through boxes and sorted files (a long overdue task). Then, to make it all more fun, my Mom called to let us know that she and my stepfather would not only be coming for a visit (they'd called the week before to tell us that) but that she'd managed to switch some shifts and would be there two days earlier. All this to say; I didn't take any photos of us packing, because it was kind of a nightmare. I *PACKED* my camera, but didn't take any photos at camp because we were so busy *DOING* stuff. It was hot and humid and perfect though! We have a great group of girls this year and some of the Pathfinders joined us so we had helpers for each patrol. It was one of the best camps ever for me as a leader, but I still found myself a little too busy to stop and dig out the camera. Hopefully I'll have more opportunities at our week away in Sussex in August (so excited!). For those keeping track though, Guide Camp at Camp Chip was happily crossed off the bucket list and girls and guys (who got to stay home and play video games) were super happy. It has become our family tradition in the past few years to spend Canada Day (July 1st) in beautiful Saint Andrew's by the Sea. It's such a beautiful seaside town, so warm and inviting to tourists, and they really do Canada Day up right. It's one of the big highlights of our summers. Settle in, we had a full day and this is going to be a long post! We got away a little late this year, by the time I got the picnic lunch packed and all our things together. Finally, we arrived! Eventually everyone had sheets for the town-wide scavenger hunt and it was time to play. And the girls. Everyone is delighted that I caught them all mid-flight. No feet on the ground for these racers! The reward for participation is a voucher for a free hot dog lunch up at the Legion, so we went to collect. We had to hustle; it was a few blocks away and the parade was starting shortly. This guy wanted to go before his sisters had even run their heats. We got back and got settled in for the parade. By this time the sun had come out BIG TIME and we were caught with no sunblock. It had been drizzling and overcast when we left home and the forecast was for cloud and rain. The meterologists got it wrong! Waiting was almost as fun as the parade. Lots of people (and pets) showing their Canadian pride! The parade is a modest one, but sweet and keeps that small town feel. Sweetpea only had one thing left on her scavenger hunt....a signature from a mountie. Fortunately, they were at the front of the parade and she wasn't shy about messing with parade formation (yikes!). Thanks to this RCMP officer for being a good sport! That's right, Scouts Canada not only lets in gays, it also lets in GIRLS. Screening for leaders, but no discrimination. At all. Back when I was in High School my friends and I actually had an all-girl Rover Crew. It was incredibly fun. We went on trips with other (male) troops. The world did not end, nor were there any shenanigans. This troop was headed for the big jamboree in Alberta this summer. Moving on, I thought this group in their kilts was so fun, especially that little guy on the tandem bike. Oh for cute! When the parade had ended we wandered the Market for a bit. We said hello to our friends from The Warrington Farm, the delightful and always smiling Krysta from Morning Sun Pottery, and enjoyed the new offerings this year. There was a wood-fired pizza truck that had the most delicous looking fare, and a Crepes truck too. Line-ups were crazy and there was no way we could get close. We didn't stop to photograph much, but I did snap a shot of a very talented musician. Speaking of musicians, there was a group playing in Sheriff Andrew's house. With that and the trifle being served it was a happy little kitchen party and I could have stayed all day. Sadly my children weren't feeling the same; once they'd finished eating they were off for more exploring. We wandered Sheriff Andrew's house and did the kids' activities in the basement. There was something going on on the back lawn but there were too many people for us, so we kept going up the street. ...and all the way to the pier, where we discovered the tide was out, so we decided to do a little beachcombing. We usually walk out on top of this dock, so walking alongside it was a new level of fun. Next stop was the Ross Museum, where the kids did crafts on the lawn while the adults enjoyed some really fantastic music. I'm still kind of kicking myself for not buying one of this girl's CDs. She had a really lovely voice! Finally it was feeling like suppertime, so we went up to the blockhouse to change into warm clothes, park the car, and have a picnic. The kids had some fun playing on the cannons and rolling down the lawn as we watched the tide and the clouds roll in. Were we out there just a few hours ago? When we'd played for a while we decided to walk into town to kill some time. We browsed the storefronts, bought some glowsticks at the dollar store, and went to the very awesome children's playground. At the playground it started raining, but the kids didn't seem to care. We wandered back to the blockhouse again to claim our spot for the fireworks, wondering the entire time if there would BE any fireworks. I sat on the picnic blanket in my rain gear and read a book while the youngest two huddled under blankets and raincoats until they fell asleep. The Princess and Hubby read books in the car. Just as the sun set it stopped raining and the fireworks were able to go forward. It took until about half way through the show to wake the Boy up enough to watch though! At this point a big cloud moved in....I wouldn't say the show was ruined but it was diminished a bit. BOOM!!! Happy Birthday Canada! We love you! Something we've been doing without thinking about for the past few years is creating a Summer Playlist. It started 5 or so years ago with our first trip back to Ontario in years with smallish children. Both DH and I can stay alert better and drive longer if we have good tunes to sing along with, so we ripped all of our cd's onto our computer and burned some epic mp3 mixes onto CD for the car. We weren't even really thinking about the kids, just making our drive go better, but they loved it. It became something we'd re-examine before every big trip, and we usually made new CDs every summer. Last year our CD player in the car gave up the ghost in the middle of our Ontario trip, so DH picked up a super cheap mp3 player and car kit at Canadian Tire and we were good to go again. 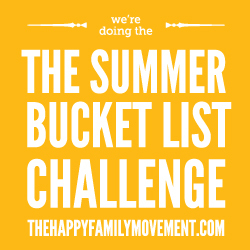 Since we weren't planning any big trips this year I hadn't even thought about a playlist, but Sweetpea had it near the top of her Summer Bucket List. Need to have good tunes for adventure! For my first try at our list I put together everyone's favourtite songs. I ended up with over 9 hours of music. Oops! I don't think we need a list that long! I did some editing; took out all the instrumentals and a lot of the older stuff (but not all of it) and basically pared it down to the stuff we like singing along to best. It's more of a Moeller Karaoke List than a sweet Summer Playlist, but we like it. We finished it up on June 30th in time for our drive to St. Andrew's for Canada Day, and we've been listening to it every time we get in the car since then. ...and a bunch of new-to-us artists/tunes from a NoiseTrade sampler we downloaded this fall. The list is maybe a little heavy on the girl power, but we all have fun with it and there is lots of happy singing and giggles. Feel free to ask about favourite tracks in the comments!